Ashutosh Kumar Co-Founded Testbook.com along with Narendra Agrawal. Both of them are alumni of IIT Bombay. Ashutosh has been in the education industry for almost 8 years. 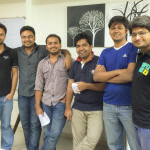 While studying in IIT, they had started Excelmentors.com, where they mentored students preparing for IIT JEE. After 1.5 years of running that, they learnt a few things. First one was about running a successful company with attributes like compatibility, getting good founders, what business is all about, how to scale business etc and the second thing was about their target audience, the students. Since the students did not have purchasing power, they had to convince not only the students but also their parents and their older siblings. These learnings helped them to understand that education is like consulting services and the parents were reluctant to pay because they thought that they knew it all in terms of guidance on how to go about the preparation for their kids and hesitation is more when the venture was not branded. They connected with their friends and began searching for other Co-Founders to join them in making the tech heavy and good user experience platform. Now Testbook has six Co-Founders who are all from IITs and armed with good learning from the early start-up and multinational companies, they launched Testbook in Jan 2014. The team wanted to create a one stop learning platform where learning, tesing and mentoring is done in one cycle. With over 70 lakhs students that took online tests, the market was big enough for them to invest time and money into building a platform to offer online mock test. They also began building chapter based tests where the students can login anytime and can take these tests to get deep analysis. For e.g., thousands of students takes the test on a flexible date and get comparative results which gives them a real time update on where they stand in reference to the others. Recently they came up with “Live Tests” where the tests are conducted on the same platform on same date and time, simulating the exam environment to test pressure and knowledge of the students and to make them get accustomed. Since none of them came in with a Sales & Marketing background, they were not sure how to reach and how to acquire their customers (students) on their portal. They analysed the marketing methodologies of successful B2C products and went with the Freemium model and kept the subscription free for a couple of months and the students began signing in. The team began analysing the browsing behaviour of the students and that helped them do a better product. This helped them give the market what their customers wanted instead of giving the market what they could provide and built the trust on the platform. For 10 to 11 months since inception, the platform was completely free which gave them a good window of learning and then they came up with an additional full-fledged sales product. Throughout this tenure of 11 months they understood that the consumer needed a good product, competitive pricing and a good customer service and they built a sales strategy around these three needs. The next thing to work on was the Pricing. They believed that their product was good and so they only needed to reach a good sample set of people to validate if the product will sell by itself and hence they wanted to reach out to a maximum no. of students who were studying for Post- Graduation competitive exams. Since 60 to 70% of the students were already on internet, it was easy to reach them through social media and content marketing. They gave some rewards and good discount to begin with and made the students pay them after the trial to build a decent set of customer base. The next one was customer services where publicity played an important role. They utilized the satisfaction of the existing customers to build good testimonials and spread the word about the platform through the students and began getting lots of hits and they came up with a full-fledged paid product in Dec 2014. Ashutosh recollects a mistake that they did. The entire team was fully excited about getting lots of customers when they launched their first paid product. This was based on the learnings from the 11 months of tracking user’s behaviour but there was a dismal paid conversion percentage. They went back and changed their marketing and messaging but nothing worked. When they began talking to a few people on a random survey, they realized that the students normally take these sample tests three to four months ahead of the main examination, but in this case, the launch of this product was just one month before the main examination – GATE. They realized that the timing of the launch of the product is very important for them and they mistimed it and they take care of timing their launches of new exams and their marketing in alignment with the examination dates which is now getting them the desired results. In Facebook marketing, the organic growth was completely free of cost by offering a good product as if you ask a student if they liked the product, they liked it and their network effects shared it with many of their friends who were also from an engineering background. They also had a referral program and launched a few sponsored ads towards the customers who were taking GATE exams. Their edge was that the content for the mock tests were developed by GATE toppers in IIT and this platform also had an algorithm (machine learning components) informing people on what the top 10 easy and the tough questions were in order to assess themselves in subjects relative to the other students. Ashutosh advice to startup founders – In a startup, everyone in the founding team is aggressive and all of you will run fast. However, the market will not run with you unless you learn fast from the mistakes. He says that even though they have around 74000 registered users within one year, this could have been tripled if they had taken care of the small-small things which turned about to be mistakes that they realized later. Testbook has around 74000 registered users within one year and their users have solved more than 44 lakh questions on this platform. They have raised funds from angel investors. They have around 25 plus employees mostly from IITs. They have been featured in more than 20 newspapers and online platforms like ET, Hindu, Indian Express, HT, YourStory, VCCircle to name a few. They have been featured as the top 100 Start-ups in 2015 by Sutra HR and as one of the top 80 Start-ups to work for in 2015 by YourStory.